Being an agent isn’t just about selling policies — it’s about being a source of support. That means educating your clients, keeping track of the details, following up, providing quick response times, and — if you’re really good — sending birthday and Christmas cards. But how can you take your reputation and level of support to the next level? What’s even more is that the underlying reason for this isolation stems from the feeling of not having meaningful connections with people.2 That’s where you come in. You can be the connection point that someone needs to feel appreciated, needed, and meaningful. Beyond helping your clients in a very human, lasting way, you are also establishing yourself a trustworthy agent. The most basic of business concepts is that customers and clients want to feel valued and appreciated. If your client is truly lonely, your supportive role is even more important. “Humans evolved to live in social groups, and we’re most comfortable when we feel part of a group — more relaxed, happier, with lower blood pressure and cortisol levels,” says Linda Waite, director of the National Social Life, Health, and Aging Project and a professor of sociology at the University of Chicago.2 You have the ability to move isolated clients into a social group where they are not only more comfortable, but more appreciated. 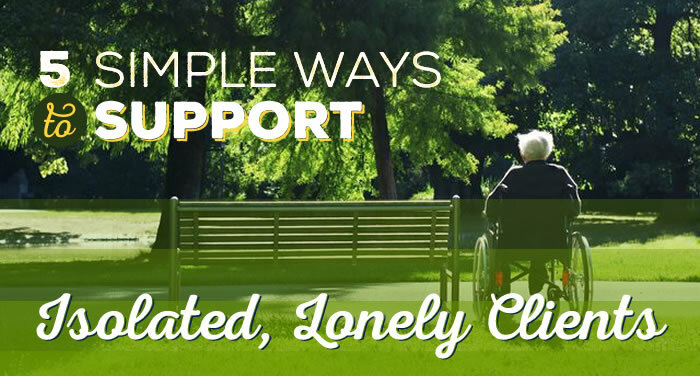 Here are 5 simple ways to support lonely and isolated clients. The key to successfully supporting lonely clients is to show real, honest interest in their lives. If you aren’t genuine with your intentions, you’ll probably come across like Jerry Maguire before he writes his mission statement. The best way to have a genuine conversation is to gather and remember details about your client. Do they have children or grandchildren? How old are they? What stage of life are they in? How did that wedding go? Did their friend end up winning that 5k? Did their church end up finding the right pastor? Did their Christmas go as planned? You might be thinking something like “yeah, right — I can’t remember where I put my keys this morning. How will I ever remember how old my client’s grandkids are?” That’s where a functional follow-up and client detail sheet will come in handy. You can do this in a variety of ways on a variety of different platforms. We have found success with AgencyBloc. If you’re thinking of moving to a new system or want to learn more about how we moved to AgencyBloc, you can view our Webinar here. If you’re just starting out, have a smaller amount of clients, or want to take some time to research and look into the different options, you can always begin by keeping a spreadsheet of your clients so that you can easily remember details about their lives. Over time and as you develop lasting relationships, you may not need to reference the sheet anymore, but it can be a great tool to spark your memory for new clients. Here’s a simple spreadsheet we created that you can download and customize for yourself and your own needs. Touching base with clients doesn’t mean you only connect up around holidays or renewal dates. Establishing a constant communication is not only a smart business tactic, but it can be vital for your isolated clients who count on your interactions. Your client will immediately think your personal questions were simply for the sake of small talk. How much more powerful is it to give a call for no other reason than because you genuinely want to see how they’re doing? That kind of conversation has a lasting impact. It seems like such a small act, an almost insignificant act — how could it really do any good? However, you’ve taken someone’s average day and have added a burst of unexpected care, and that could be enough to drastically affect someone living in isolation. Doing this on a regular or semi-regular basis is a great way to show affection and also to set yourself apart from other agents. Now, it’s not really your duty to wake up and go through a list of clients to check up on. That’s really a close friend’s or family member’s job. However, checking in every 6-8 weeks is a great balance of mitigating loneliness while not being overbearing or poorly managing your own time. It also can be useful to pick out the clients that you know are living alone or may be dealing with some deep struggles and specifically make a point to reach out to them on a semi-regular, monthly basis. The idea that a phone call can have a lasting impact is not new. For example, hearing aid specialist Kristin Seiler followed up with one of her clients after she had an adjustment made. It was a short call — only about 10 minutes or so — and she learned a lot about her client and her general life concerns. She decided to immediately write her a note letting her know that she was thinking of her and was wishing her the best on her upcoming knee surgery. The moral of the story here is that when you build a connection with your client, they are much more likely to be loyal to you even if your competition has a better offer. A relationship has value. After all, how many agents actually take the time to develop personal relationships with their clients? It’s a win-win; you are doing the right thing, and your client will thank you for it. While we’re making the shift into the digital age, many seniors are crawling into their shells and hoping that they never have to figure out how technology works. This is where communication can be difficult — many of us are used to communicating via email, social media, and video chat. However, to effectively communicate with your client, you need to speak their language, so to speak. The art of writing a hand-written letter is not lost on many of us, and it’s definitely not lost on the 75+ age group. You probably already know that sending personalized card on birthdays and holidays is a great way to remind your clients that you’re thinking of them. You should pretty much have a set, regular system in place for how you interact with new clients. (If you don’t, get started here.) However, sending a card for no other reason than to say, “Hey, I wanted to reach out and let you know that I’m thinking of you” sets you apart from everyone else. When you take the extra initiative to do this for clients that you suspect might be dealing with loneliness, the impact is incredible. If this sounds like a good idea but you don’t know how to personalize cards, all agents that write business with us can contact Jason Ferguson for help with card design. While not every interaction with isolated clients should be purely business-related, they will appreciate being kept in the loop on the latest news in the industry. The best way to do this is to have an email newsletter or email template that you send out to your clients on a regular basis. Your newsletter should aim to educate clients on product updates such as rate increases, Medicare news, any relevant health care info, and to make them aware of other products you offer. However, older clients may not have email, let alone a computer. This way, you’re not wasting the time and postage on mail that someone doesn’t want in the first place. However, if you find that they do want the updates, make sure to take the time to hand-sign the document and include a personal note or blurb. This will give your letter a personal touch and will be significantly more valuable to a client, especially if he or she is living alone and doesn’t receive much acknowledgement from others. You can also give these updates via phone call, but your expectations need to be realistic. We advise only calling when there’s an update that specifically affects their policies or if you’ve seen a better plan come to light. You can’t be there for everyone all the time. You may be swamped with a bunch of new clients, you may be worried that your client will keep you on the phone longer than you have time for, or your client may need more attention than what you’re able to give. In those cases, digital help may be the best solution. These options are best suggested to family members. This is a very easy and consistent way to show a family member that you care, and it works seamlessly in the background. You can set this up and add others to the “care circle,” and you can also record a personalized greeting. It’s a great way to monitor not only your loved one’s health, but their overall well-being. This system automatically calls your loved one every day to make sure they’re doing OK. Like Care Angel, you can also create a care circle to make sure that someone is always monitoring the data received by the automated calls. You can try out this service with a 14-day trial, and after that, the plan is subscription-based with a monthly fee of $14.99/month.6 It’s never a bad idea to go a step above and beyond and to bring up these helpful options to your clients and their families. There you have it — 5 simple ways to show your clients you care, to increase positive reception of not only you but the company you represent, and — as always — to simply do the right thing. Check out the full story here: http://www.linkedin.com/pulse/simple-phone-call-can-leave-positive-impact-kristin-seiler.